CBNA sophomores Emerson Ross (left) and Logan Morton work with UNH professor Dr. Nan Yi on a project to create biodiesel. Recently, some Coe-Brown Northwood Academy students taking introductory biology and introductory physical science classes had the opportunity to work in an interdisciplinary collaboration featuring student designed experiments exploring calorimetry of food, connections to energy use in the human body, research into biological sources of fuel production, and research into the production of biodiesel using corn products, which led to classroom debate on the pros and cons of using biodiesel. 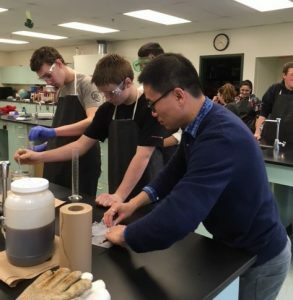 As a result of this collaboration, students had a unique opportunity to experience an in-class field trip, with Dr. Nan Yi, Professor of Chemical Engineering, at the University of New Hampshire as a culminating activity. Bringing chemical engineering into the CBNA classroom, Dr. Yi and the students chemically produced biodiesel from used cooking oil donated by the UNH dining halls. By the end of the extended class, the students had produced enough biodiesel to make small oil lamps which used the biodiesel as a fuel source.